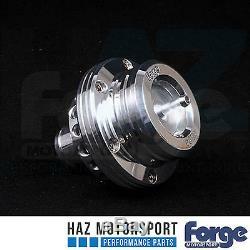 Forge Motorsport Smart Car Piston Dump Valve and Fitting Kit Product Description This kit includes everything that you will require to install the atmospheric dump/blow off valve to your 600cc petrol Fortwo's, all 700cc petrol Fortwo's, all Roadsters, and the Crossblade up to the early 2007 model year. 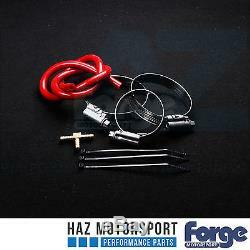 Also included in this kit is a replacement silicone boost hose. These will not fit the Forfour, the 800cc diesel Fortwo or the new 999cc Fortwo, , including the 999cc Fortwo Brabus. The valve has been specially designed for this vehicle and uses twin springs and dual pistons to prevent the valve from leaking air into the intake system at idle with a 12mm inlet to ensure a faster air velocity so that it sounds fantastic. This product comes with an option of three different colour hoses. Please notify us which colour you would prefer out out of the following, black, blue and red. PLEASE NOTE THAT A DEFAULT COLOUR WILL BE SEND OUT IF WE DON'T RECIEVE A NOTIFICATION REGARDING WHICH COLOUR YOU PREFER. 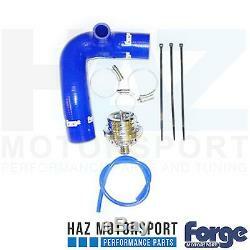 In The Box: 1 x FMSCDVK Valve 1 x 5mm T Piece 1 x 500mm of 4mm Vacuum Tube 3 x Cable Ties 1 x 35mm Hose Clamp 2 x 55mm Hose Clamp 1 x Silicon Boost Hose, with Valve Take Off 1 x Instructions 1 x Forge Sticker Distributed by Haz Motorsport. The item "Forge Motorsport Piston Dump Valve and Fitting Kit Smart Car Fortwo/Roadster" is in sale since Tuesday, August 1, 2017. This item is in the category "Vehicle Parts & Accessories\Car Tuning & Styling\Air Intake & Induction\Dump, Bypass & Blow-Off Valves". 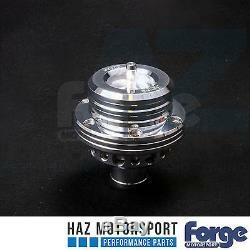 The seller is "haz_motorsport" and is located in GB. This item can be shipped worldwide.